Who isn’t thinking of eating a touch healthier after a holiday calorie blow out (the average person gains 4 pounds between Christmas and New Year’s!!)? Coupled with January-Credit-Card-Statement-Shock- a serious and curable condition, canned beans need to find their way into your shopping cart and cupboard. Canned beans offer so much promise. No-salt-added varieties have very low sodium. Beans are the largest single source of protein for plant-based eaters, a great source of B Vitamins, and exploding with minerals like calcium, magnesium, potassium and iron. So very very good for you, how could you not just open a can, grab a spoon and dig in? Because it tastes awful. Just awful. If you say you truly like the taste of beans out of a can I’m calling you a liar. Now, cooked beans, beans that have sat overnight in water, then are drained and reheated with aromatics like onion, bay leaves, maybe a ham bone, those, those are delicious. Adding aromatics and flavor is exactly what you can do to transform your run of the mill, private label, grocery store, beans. I owe my advice on seasoning beans to a dear, and talented friend, Erin, who made beans and scrambled eggs for me the first few weeks of Ella’s life, when I was wondering just what the hell I’d gotten myself into with this tiny little inconsolable creature. 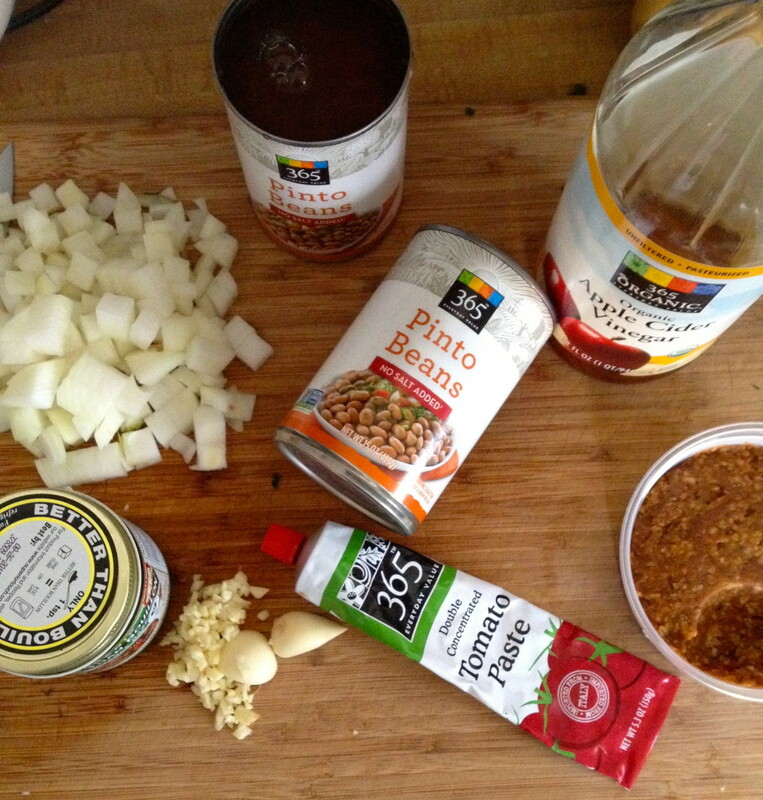 Erin took over cooking for the week she was visiting, at the stove creating magic with a can of pinto beans, some cumin and vinegar. Her meals were cheap and filling and are just the thing to get you through January feeling like a champ. 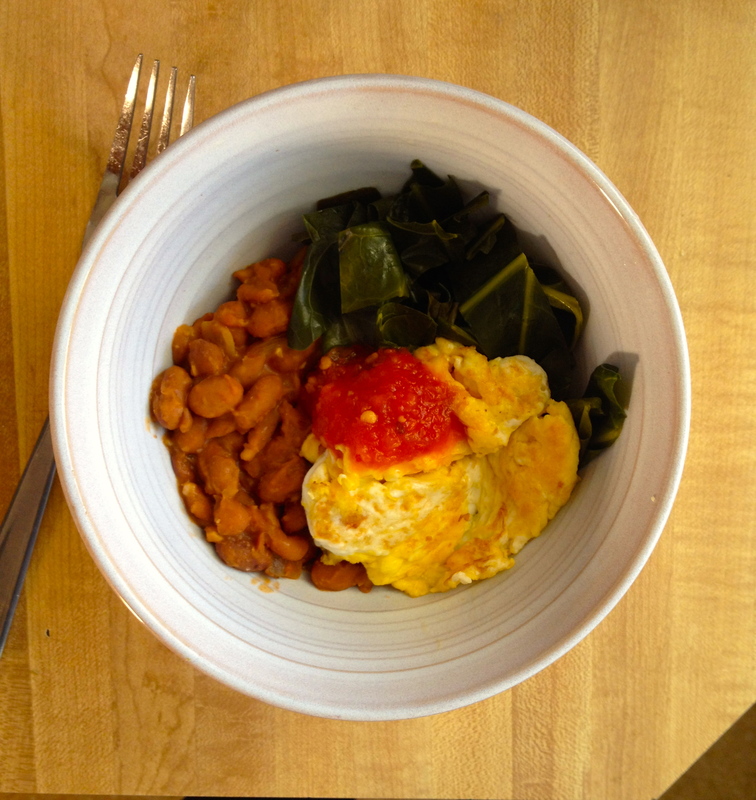 Pair your beans with steamed kale or spinach, or serve over a baked potato. They also taste great when topped with a fried egg or a handful of crumbled tortilla chips- ok, not the healthiest, so just stick to the kale. The recipe is less of a recipe and more just a few steps, beans are incredibly forgiving, so play with measurements, just keep tasting as you go. First, dice a onion and a couple cloves garlic. Saute that onion in just a little olive oil until translucent, throw in some chopped garlic, followed by a good tablespoon of cumin- season big here, or go home. Add a can of beans (a dirty little secret, when my beans are organic AND No salt added, I’ll add the whole can, liquid and all), and, If you’d like, a cup of chicken or vegetable stock. get this baby going on medium-high and with a potato masher or the back of a wooden spoon, lightly mash about half the pan. As the beans continue to cook, I like to add a tablespoon of red miso and a tablespoon of tomato paste. Once my beans are warmed, lightly mashed and taste just right, I add a splash of apple cider vinegar and call it good. These are my preferred seasonings, but I’ve also added fish sauce, mushroom stock, a diced jalapeño and sriracha, not all at once, but I think you get the idea. ← Eat Kale For Breakfast. Seriously.